Marketing is changing. But then, it needed to. Customers are no longer satisfied with bog-standard treatment, and companies are trying, at least to some extent, to react to this. For most of them, however, much more work is needed. Customer-centricity is the stated goal of most marketers, to handle the challenges posed by increasing global competitiveness and changing customer behavior and expectations. It is closely related to digitalization, because effective digitalization would be a big step towards enabling customer-centricity. Putting customers first relies heavily on good data utilization, and the natural next step from data is solid analytical practices. Only through data and analytics can companies discover changes in digital behavior in time to react to what is going on. They also have to stay relevant with what is going on in the world – and change today happens faster than ever. Customer-centricity as a concept leads to many things, including ‘omni-channel’ marketing. In practice, the sequence is likely to be that the move towards customer-centricity drives the need for omni-channel marketing, in turn requiring digitalization. But does this mean non-digital is dead? Of course not. Instead, effective marketing requires digital and non-digital collaboration, although this also holds challenges. There are, for example, questions about digital and non-digital consistency, and the Influence of above-the-line marketing on below-the-line and attribution. Customers have needs and preferences that can be uncovered through analytics. These needs and preferences may be explicit or implicit. Organizations typically collect information about explicit needs through market research. The challenge, however, is to surface the implicit preferences. Marketing analytics is helping many organizations across the globe to convert customer data, including demography, transactional, and behavioral information, into insights about customers. Customer-centric organizations are moving towards using analytics to help them go deeper into the available data and get insights about customer segments and preferences, their requirements about products and services, and their responsiveness to communication. Improved transparency is the key to using information effectively. Becoming a customer-centric organization means not only gathering all customer information at a central place, but also seeing the customer as a whole. Companies can use behavioral and demographic data to determine the type of customer and how to market to them. By using behavioral segmentation techniques, rather than traditional segmentation, companies can identify groups of similar clients, which otherwise are hidden within the large volume of data. . They can use this information to understand which segments are profitable and how to increase the profitability of others, for example, through specific offers. Using the response information to these offers, we can create predictive models to identify the right targets for future campaigns. These let us predict likely future behavior based on the past, so we can better estimate the probable response rate. Customers might not tell us what they are looking for and how they are going to behave, but thanks to analytics, we can infer their needs and offer them something to meet those needs, without them even knowing. In addition to the dynamically changing customer’s expectations, the technology also is adding another dimension to customer-centricity. With high penetration of smartphones and mobile internet, customers have instant access to various digital channels. While this is an opportunity for marketers to easily reach out to the customers – anywhere anytime, this also offers challenges in terms of managing communications through multiple channels effectively and consistently. One approach to handle multi-channel communication with consistency would be detach communication decision from channel and to have them at customer level. In other words, these decisions should be channel independent and should be taken centrally, of course the analytics to play critical role as mentioned above. However, effectiveness of multi-channel communication does not necessarily depend on centralized decision making only. The inter-dependence or cross-channel impact would also be interesting to consider. Here, digital and non-digital world might come together to drive most effective communication. In the research paper “Effects of Multi-Channel Marketing on Consumers’ Online Search Behavior” by Michel et. al., in the Journal of Advertising Research, Dec 2013, we see this space spanning from drafting ‘communication journey’ (The Challenge of a Truly Omni Channel Approach for Retailers, Theodor P) to channel attribution. Another opportunity due to advancement of technology is capability to store and process data (speed and volume), commonly known as big data. Marketers can process data and can make complex decisions in very short time, in many cases, in real-time. Once the technology piece is controlled, this offers enormous opportunities to enhance the effectiveness of omni-channel communications and analytical insights. The emerging technology like ‘location identification’, ‘iBeacon’, and ‘deep packet inspection’ are allowing to capture significant real-time contextual information, and high performance analytics allows to process these information along with other, in real-time to make analytically driven communication decision – all of them still centrally at customer level. 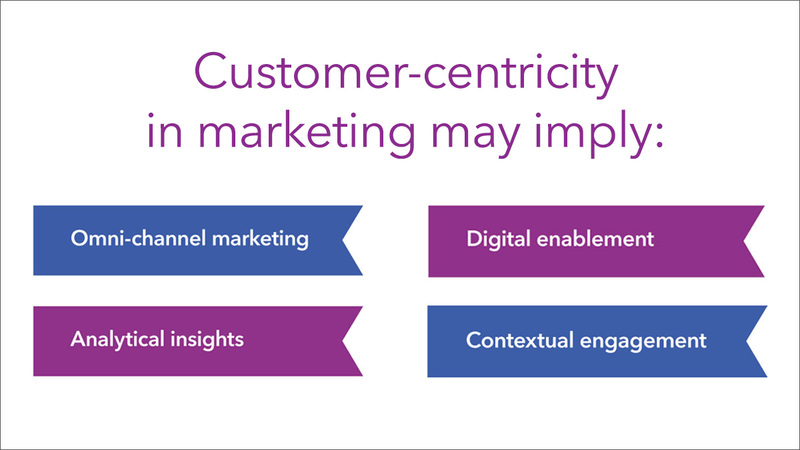 Customer centricity was always at the forefront of marketer’s decision parameter. However, with dynamically changing market and technology, it has evolved more and gathered more steam. Almost for the same reasons, marketers are also capable to make customer experience more ‘delighted’ with access to better technologies in communication, analytics and data processing. The quest for customer-centricity is on… customer is still looking for more… for better… are organizations ready to response…. ?